Christina Gabbitas is a children’s author, poet and voice artist. Christina first had success with the Felicity Fly series , and more recently Share Some Secrets . A Yorkshire Women of Achievement in Education winner 2016 and TPBP Dame Beryl Bainbridge Award 2015. Diamond Derek is a great looking guy, he reminds us of Simon Cowell. Perpendicular Peri is our favourite. Christina has a brilliant imagination. Please keep the books coming. Our children are learning from the song! A great idea and brilliantly illustrated. The illustrations are truly masterful; humorous, engaging and educational all at once. A great, fun way to introduce mathematical terms! Brilliant book and great illustrations (very funny)...my daughter loved it. A great way introduction to shape. A lovely book with fun characters, illustrated beautifully. Fun, exciting and educational with a good sing a long at the end. A brilliant idea, beautifully done. Nice illustrations too! Who said learning couldn't be fun?! An amazing way of learning about shapes. 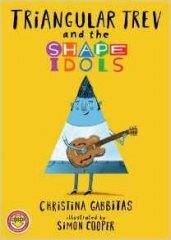 An impressive way to introduce children singing about shapes and their meaning. This made a great present for our nieces who were thrilled to meet you in WHSmith Bookshop Beverley. The CD is a constant companion in our car. Fantastic way to teach children about different shapes. We especially like Nonagon Norma's hair. I think this is a great idea. Explaining to children all the different shapes and their names. I have never seen anything published like this before. It was great to meet you in WHSmith Beverley, our nephew loved having his book signed. A fun story with a great learning element. We have been listening to the song in the car. Good luck. We like the idea of the band idol competition and love the illustration of Diamond Derek (Simon Cowell). Congratulations on such an innovative idea. An excellent idea. An encouraging way for children to learn about shapes and their names. Brilliant idea! Our sons love the story and song. My wife and I like the learning element. It was nice for us to meet you and your illustrator in Meadowhall WHSmith at your launch. Our children's favourites are Nonagon Norma and Equilateral Eric. We hope you win. My son really likes the song. I'm sure it will help him to remember the shapes.